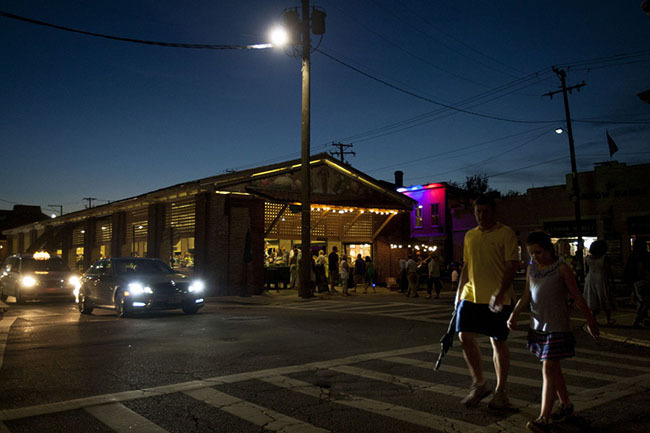 A Shopping Spree at the Charleston Night Market puts a spotlight on the creativity of Charleston. CHARLESTON, S.C. – The Charleston Night Market is a place that even an “I-hate-shopping” curmudgeon whose retail philosophy is “get in/get out” can enjoy. That’s because this lively location puts a spotlight on the creativity of Charleston and the South Carolina Lowcountry. A warm glow emerges from the Charleston Night Market, where all vendors are artists and craftsmen from the region. Image by Charleston Night Market. Like almost everything in Charleston, this location is dripping with history. Commerce in this part of the city “where the Ashley and Cooper rivers come together to form the Atlantic Ocean” (as some proud locals proclaim) began in the early 1700s. The three buildings the Charleston Night Market occupies were built between 1807 and 1820. They stretch behind the Great Hall, a Greek Revival-style building that is one of Charleston’s landmarks. The whole complex has a mix of merchandise vendors by day, but that changes every Friday and Saturday evening and most Thursdays. Fish, meat and vegetable sellers from earlier eras have given way to artists and craftsmen who create an array of items for today’s visitors. Market managers say that between two and three million people a year browse and buy here. The Night Market buildings are three blocks of open-air sheds with vendors on both sides of a center aisle. You’ll find potters, woodworkers, painters, photographers, doll makers, jewelry makers, fabric artists and others – all eager to talk about their creations. As diverse as these makers are, they have a common bond – all are from Charleston and its immediate vicinity, plus a few from slightly farther away in South Carolina. 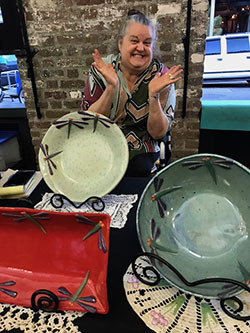 “Everything here was crafted by the vendor, someone who has mastered an art,” said Karen Williams, operations manager, noting that vendors are carefully selected twice a year. 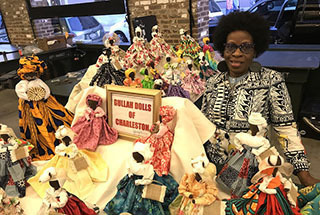 The Charleston Night Market opened in 2010 after a $5.5 million makeover of the entire market and is operated for the City of Charleston by the City Market Preservation Trust. General manager Barry Newton says the Night Market has expanded the entire market’s impact. “The market has been successful for decades. We wanted to take a turn with the Night Market to provide space strictly for local vendors and their distinctive handmade items,” Newton said, adding that there’s an especially casual feeling to the Night Market. Photographer Joe Benton agrees. 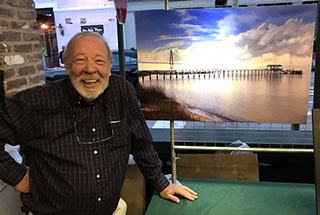 He is a Charleston native who formerly was a staffer at Southern Living and The Atlanta Journal-Constitution and who now sells images of Charleston and Lowcountry scenes. “There’s a great vibe here, a friendly feeling and an aura of authenticity. We want visitors to enjoy Charleston’s creativity – and we hope they will find items at the Night Market to take home and remind them of a great visit to our city,” Benton said.